January – what makes January unique? January is named after the god, Janus. You know, the one with two faces. One looking back and one looking forward. It’s a month when we do a lot of reflection. We think back over the year just ended. We come across the “best of” lists and maybe we review the music we’ve been listening to, the Facebook pages we’ve visited, the people we’ve met, the people we’ve lost and our own personal significant events of the year. What did all that bring up for you? Then we turn to looking forward and make resolutions. Or do we? I suspect resolutions have become less popular, not least because they always, but always, seem to be so hard to keep! But if we don’t make resolutions we probably at least decide to eat differently, exercise differently, manage our finances and/or our homes differently? Don’t we? Did you? One of the things I like to do in January is quickly create a new calendar to hang on the wall. I collect together one image per month taken in the year just ended and I use an online printer like Redbubble, or Whitewall, or even Instaprint. I upload each image into its relevant month and order it up. I recommend it. As the new year unfolds, every month there is a memorable photograph which conjures up an experience of that month, last year. I can’t tell you just how much I enjoy that. Want to see my twelve photos from 2018? 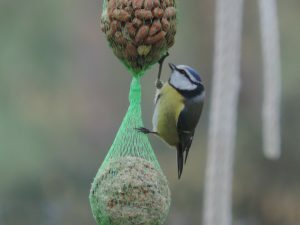 January – I buy bird food every January and am amply rewarded by the beauty of the dozens of birds which turn up to enjoy it. An every day delight! February – a visit to the Pont de Gau Ornithological Park in the Camargue. 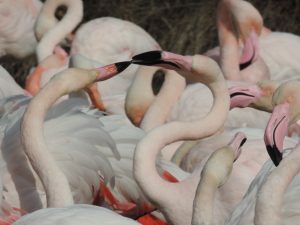 These thousands of flamingos are just other-worldly! March – continuing the bird theme, this “sitting duck” in Nîmes instantly made me think about even when we are “doing nothing” we are interacting with the world. 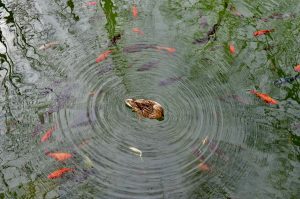 Reminded me how I should be aware of all my thoughts, my words and my actions…..because they all set off ripples around the world. 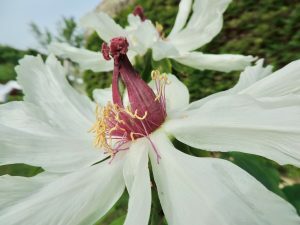 April – waited two years for this “tree peony” to flower – and, wow, was it worth the wait! What a glorious, enormous flower. 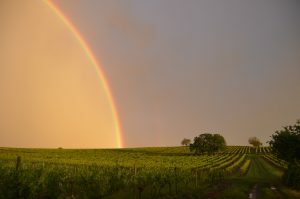 May – this rainbow lasted at last half an hour. I have never, ever, witnessed anything like it. It really looked like there was another world under the arc. Vivid, entrancing, and strangely moving. 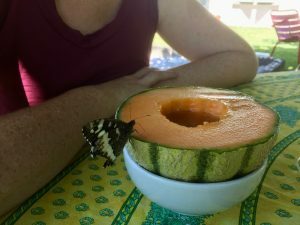 June – this butterfly decided to share my daughter’s melon. It took it’s time. Again, I’ve never, ever seen anything like this! July – sometimes it’s just the intensity and range of colour which captures me. 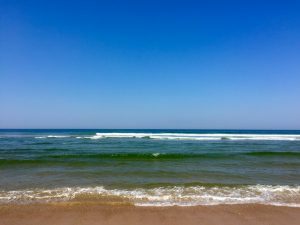 This was a glorious day at a long, long, sandy beach on the Atlantic Coast about an hour from where I live. Just look at those colours! 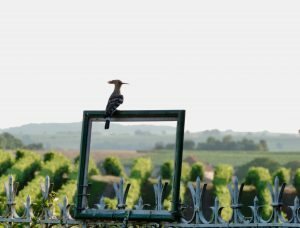 August – one of my favourite birds which comes to visit each summer is the Hoopoe. This one sat so nicely on an old picture frame. He reminds me to think “out of the box”, and to remember what “frames” I place around my perceptions. September – I can leave home after breakfast and be in Spain for lunch. 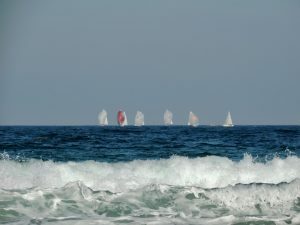 These boats sailing off the coast of Santander caught my attention. October – here was a surprise! 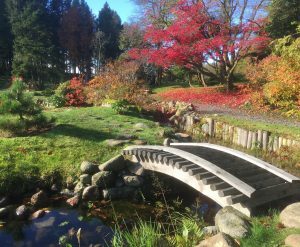 On a visit back to Scotland went to see “The Japanese Garden” just outside Dollar. I never knew such a place existed. Probably the most authentic “Japanese Garden” I’ve seen outside of Japan. 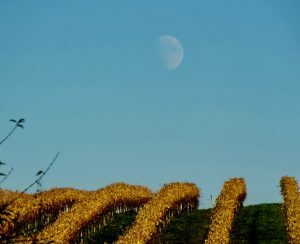 November – every autumn the vines turn this beautiful golden colour. But on this particular day I saw the big moon hanging low in the sky above them. Took my breath away! 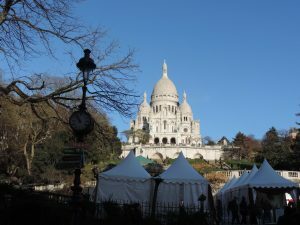 December – a trip to Paris. Even with the demonstrations and troubles which this city seems to be experiencing so frequently now, it still works its magic.